From its seemingly endless natural beauty to its quirky small towns, Door County is one of Wisconsin's most beautiful and remarkable regions. The Door Peninsula is flanked on three sides by Green Bay and Lake Michigan, and Washington Island is of course surrounded by water. But it's also home to dozens of state and county parks, 300 miles of unsullied shoreline, and countless local attractions, shops, restaurants and businesses that employ thousands of locals and seasonal workers every year. Whether workers are staying for a summer or for a lifetime, Door County is an extraordinary place to call home. Although the peninsula and Washington Island are somewhat isolated in Wisconsin's northeast corner, this remoteness contributes to Door County's distinctiveness, uniqueness and off-the-grid feel. Sturgeon Bay, the county seat and largest town on the peninsula, is approximately 40 miles from Green Bay and 80 miles from Appleton, both small but vibrant cities with plenty of attractions and amenities. For more information, see the Door County Visitor Bureau's guide to moving to Door County. Although the adventure, nightlife and hip, unique feel of the region makes it perfect for a grown-up getaway, Door County is as family friendly as it gets. Despite all its sights, sounds and attractions, Door County also has plenty of peace and quiet, meaning kids can simply be kids, running around and exploring the many parks, playgrounds and outdoor greenspaces. On rainy or snowy days, museums, art classes, and indoor amusements abound. Schools and community colleges, both public and private, can be found up and down the peninsula and on Washington Island, and daytime child care is easy to find. Places of worship, wellness centers, YMCAs, libraries, healthcare facilities and other community services are also easy to come by in Door County, so families will never have to worry about having their basic or personal needs met. When they're not on the clock, Door County's locals have plenty to keep them entertained. Wineries, microbreweries, distilleries and even a cidery are open for tours and visits. 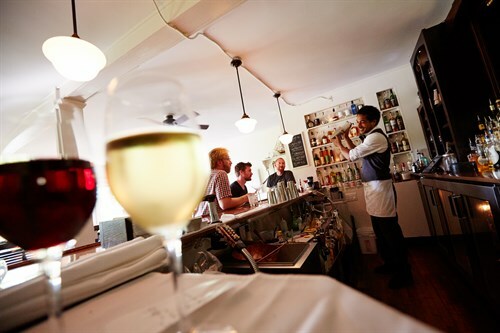 Countless restaurants of all styles and cuisines call the Door Peninsula and adjacent Washington Island home, and between the region's many bars and performance centers, there's no shortage of nightlife. Door County is also the ideal area for sports and fitness enthusiasts. The many local parks, bodies of water, hiking trails, biking paths and snowmobile-friendly greenspaces are perfect for off-hours exploration and recreation, including sailing, scuba diving, fishing, kayaking, zip lining, paddle boarding, cross-country skiing, dog sledding, golf and more. Artists of all stripes (as well as their fans) flock to the area not only for its inspiring beauty but for its expansive arts scene. Visual artists such as painters and sculptors, musicians, actors, writers and patrons of the arts will be at home in Door County, thanks to dozens of galleries, art schools, artist studios and opportunities for artistic edification. The buildings and streetscapes of the towns themselves are works of art, and the rustic beauty of the area's barns, lighthouses, chapels and nature preserves are sure to inspire. Visit DoorCounty.com to learn even more about the area and get a feel for what it might be like to live in our community.